It is Monday….ugh….In other news I have some random stuff to share with you. ~~ My memory foam mattress is fabulous, but it likes to travel. It has slid about 3 inches from the top of the bed, and it hangs over about 2 inches on Superman’s side. CC isn’t happy. I have tried to move it, but it won’t budge. I refuse to totally unmake the bed just to scoot the marshmallow. So I guess it really isn’t all that big of a problem. ~~ I signed up to adopt a US soldier. I haven’t received one yet. Anyone else do this??? ~~ I had a real boring week this past week and I’m racking my brain to think of something else to say. Nope…there is nothing. Have a wonderful week y’all. Liam Neeson is one of my all time favorite actors. Most of the movies he has played in have had a profound affect on me. Yesterday I saw the movie The Grey. Super movie btw. Anyway the poem has just affected me in so many ways. Then last night Superman and I were talking about getting a will and what to put in it…who gets what…etc. Then I thought of the poem. We live and die every day. Are we living each day to the fullest? ’cause we’re dieing each day. Then I got to thinking. What if the house burnt down. I’d have nothing to leave anyone… but memories. What have I already left the people I know. What did I teach my children? What will they remember of me? What about friends and family…did I impact them in such a way that when they do remember me that I will be remembered fondly? So today, once more “I” go into the fray…I live and die today. I’m gonna make the most of today. ♥ I haven’t been sleeping well. I haven’t been for a good month or so. I really should be since we just got a memory foam topper for our bed two weeks ago. It is like sleeping on a marshmallow. I like marshmallows. The large ones, the small ones, and even the gigantor ones they had this past summer. The point Tanya??? Oh yes. The point. The point is that I finally succumbed to the Advil PM and slept from 10pm to 11am. I ♥ Advil PM. ♥ The last 2 days have been in the 60’s here in Ohio. All the snow has melted. I can finally park my car where it is supposed to be instead of halfway out in the road because of all the piles of snow some sweet neighbor plowed right in front of my vehicle. ♥ I’ve been on an almond eating kick lately. I have decided that aside from pecans, almonds are my favorite. 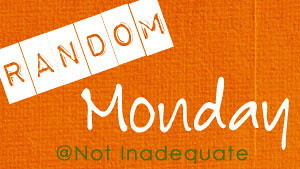 ♥♥ Monday has rolled around once again and is haunting me like a bad hangover….not that I’ve had one, but still…Monday. ♥♥ Spent New Years day with the family. Opened Christmas gifties. Yarn! I got Yarn!!! ♥♥ My BFF got me a marble rolling pin. I have wanted one of those since forever. ♥♥ I found out that I have “golfers elbow” because you know I have played all of zero games of golf. ♥♥ Obama, Congress and Senate…thanks so much for this “fiscal cliff” deal you struck. Superman’s paycheck was only $120 short. I hope you all get sand flies up your ……nose. ♥♥ Superman is in trouble. I suggested that I tried to lose 30 pounds and he stated that would probably gain 60. I’m thinking a little bit of time in the dog house might be curative.